The inclined stair lift works a bit differently than the vertical lift. While the vertical lift takes passengers to the next level by traveling up and down on a flat, vertical plane, inclined lifts are attached to a flight of stairs and travel up the staircase. They must be attached to a staircase wide enough to accommodate them and there must be enough room on the staircase for non-lift users. Inclined stair lifts are ideal for buildings that cannot accommodate a vertical lift and are preferable to elevators because they are more affordable and take up less space. The wheelchair sits on the platform and is secured in place by a ramp plate. The user pushes a button to go up or down and the lift guides her smoothly along the staircase. Provides independent and safe access to a wheelchair user within any building. Simple to use and can be easily operated by a wheelchair user. The lift platform and barrier fold neatly away against the smooth operating rail when not in use. Suitable for all types of curved and straight staircases. Completely safe for the stair lift user with barrier arms and raised ramps that protect the user that lock down before the platform moves. 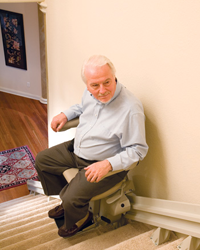 Indy Stair Lifts offers a wide range of lifts that perfectly match the needs of your home, including the Indy Pinnacle, which features a weight capacity of 350 lbs. and a travel speed of 17 to 21 ft. per minute. It offers exceptional comfort and efficiency with a patented helical drive system that makes every trip smooth and comfortable. It comes with a variety of safety features, including safety sensors that stop the lift when it meets an obstruction and indicator lights that are easy to read and operate. The seat is adjustable for height and swivels for safe exit and entry. Call our toll-free hotline at 888-203-5754 for more information on the Indy Pinnacle, our top of the line inclined lift that we proudly offer with a 10 year warranty.